Have scanned the attached files from some tiny little proof prints that had been made from stereoview negatives by an outfit in London. Had expected these to be contact proofs from regular sized stereo negs but the graininess of the images suggests that they were made from 35mm negatives. Here are two of the Streckfus steamer CAPITOL at New Orleans credited to a photographer named J. Dearden Holmes circa the 1920's. The CAPITOL's short stacks looked rather truncated but they were probably designed that way for ease of passage under bridges. 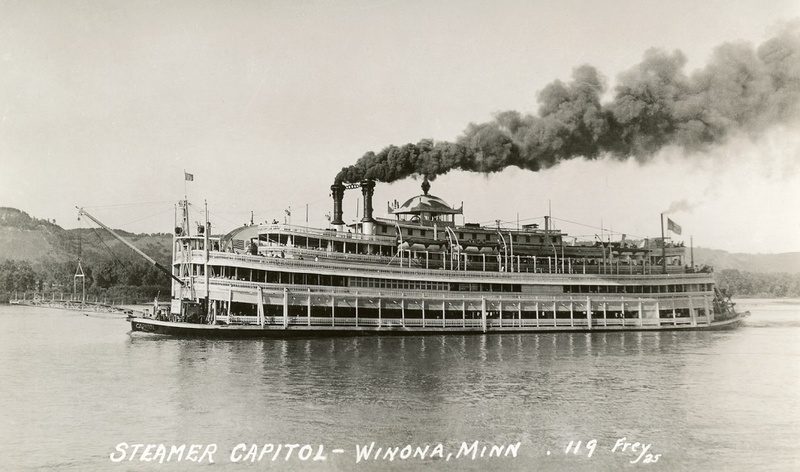 Attached 1925 photo of the CAPITOL at Winona, Minnesota. Frey could have been the name of the photographer. There was a New York City publisher of postcards named E. Frey & Co. circa 1903 to 1905 - a couple of decades earlier. The panorama was taken on October 2nd, 1907 from a high vantage point. Overall size of the print is 9 1/2 X 39 1/2 inches. The Eads Bridge in the distance on the Mississippi with the steamers ALTON and SPREAD EAGLE are prominently displayed in the left half of the panorama (in the top spot). The photo below that (the right half of the panorama) includes the steamboat U.S. 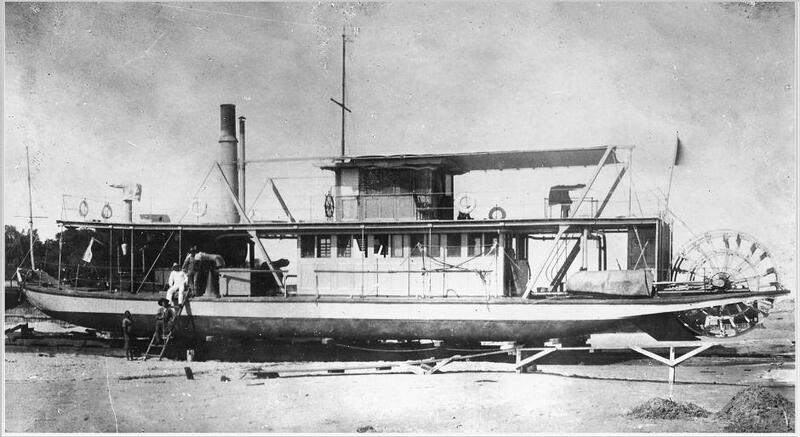 Inspection steamer MISSISSIPPI which had transported Roosevelt from Keokuk. The MISSISSIPPI is the first boat on the left recognizable from her outsized pilot house, visible on the far side of the Lee Line Wharf Boat. "Roosevelt addressed the City of St. Louis advocating the financial benefits of thoughtful transportation development, drawing comparisons to the Suez and Panama Canals. He also discussed the importance of maintaining and developing the Navy." From the Jai Alai building the guests were taken by carriages to the Jefferson Hotel where luncheon was served. A contemporary newspaper article below gives an account of the lavish hospitality of St. Louis gave Roosevelt that day. St . Louis , MO. For the first time within the memory of the resent generation a chief executive of the nation today arrived in the Mound city by steamboat and departed from the city in the same manner. President Theodore Roosevelt on hoard the steamboat MISSISSIPPI from Keokuk , reached St. Louis shortly alter 1 o'clock this morning. Accompanying him on another craft were the members of the Inland Waterway commission. The President found St . Louis awaiting his arrival in gala attire. Steamboats and other craft bedecked with flags filled the river. 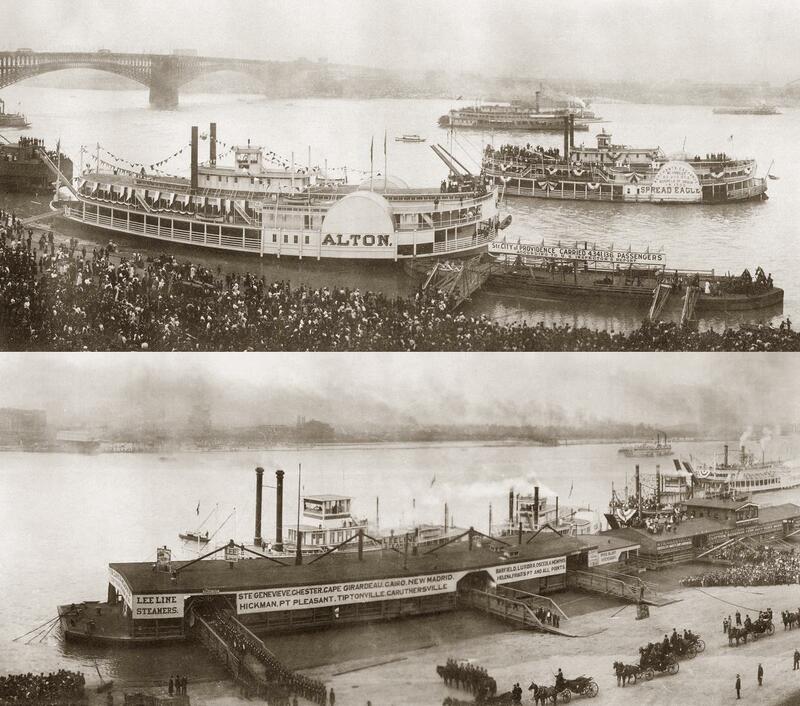 Not since the palmy days before the war has St . Louis seen so many steamboats at one time. 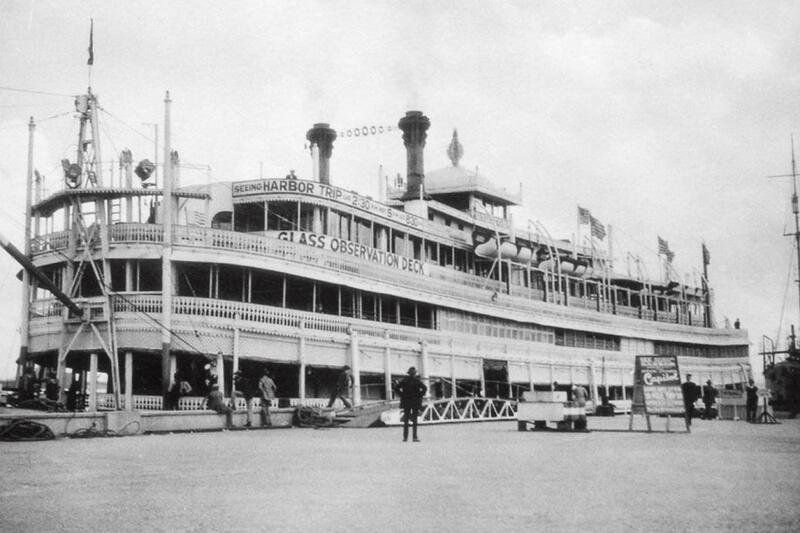 They came from Evansville , Cairo, Alton, Kansas City, Keokuk and other river points and bought delegations of business men and others desirous of impressing upon the president and the members of the waterways commission the importance of the river traffic and the urgent necessity for improvements in the Mississippi and its chief tributaries. As the president's boat came into sight it was greeted with deafening shrieks from the steamboat whistles, which were echoed by the cheers of the thousands of people who lined the river front and occupied positions of vantage on the wharfs and on the two great bridges spanning the Mississippi river. It was a distinguished assemblage that greeted the president when he landed near the foot of Locust street. Included among those present were the governors of more than twenty states, members of congress, the mayor and other representatives of the city of St . Louis and a reception committee of the Business Men's league, which had the general arrangements in charge . After the exchange of courtesies the president and his party were taken in carriages to the Jai Alai building , where he delivered his address. The route lay through Washington Avenue, Twelfth Street , Pine Street , Grand Avenue, Lindell Boulevard and other leading thoroughfares. Flags were flying from every staff in the downtown section and the city was bright with bunting. Pictures of President Roosevelt greeted the eye at every turn. Crowds lined the streets , anxious to get a glimpse at the chief magistrate and his appearance was always the signal for tumultuous cheers . After the exercises at the Jai Alai building the president was escorted to the Jefferson hotel where he was entertained at luncheon. Covers were laid for 400 and among the guests were the visiting governors and numerous other persons of note. From the hotel the presidential party proceeded at once to to the wharf to re-embark on the Mississippi . The departure was the signal for another great river demonstration similar to that which had greeted the president's arrival in the morning . Scores of boats will accompany the president's boat down the river as far as Cairo, which is to be the next stopping point and which city will be reached according to schedule at 9 o'clock tomorrow morning. 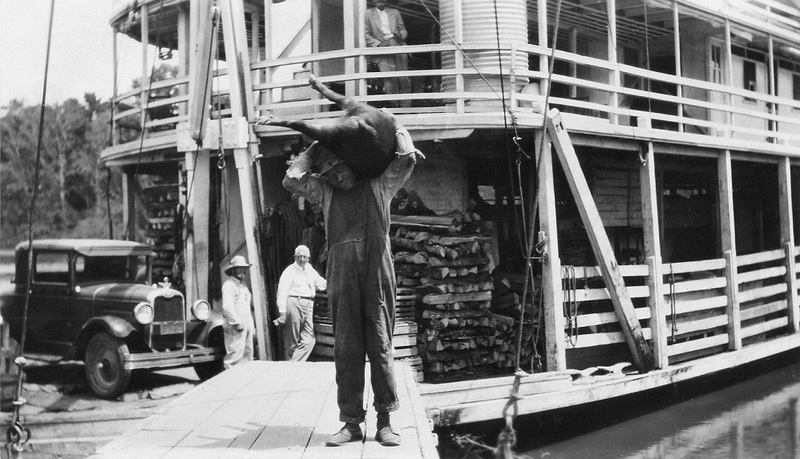 Brand new photo measuring 3.20 x 5.60 of a "rouster" (roustabout) who had hoisted some 4 footed cargo (a pig) onto his left shoulder to unload it from an unidentified steamboat and stopped on the swinging stage to pose with his burden for the photographer. On the "coupe" auto parked on the deck is what appears to be a vintage Ford Moto-Meter radioar cap hood ornament with wings. This photo from an eBay auction displays a similar radiator cap. 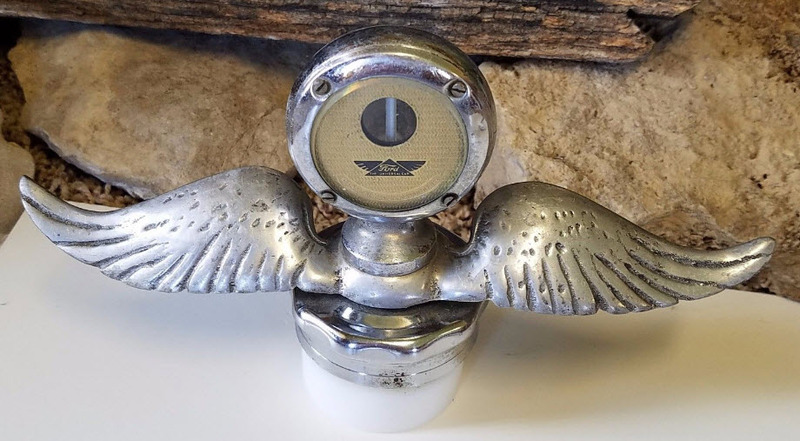 "The Moto-Meter Co, Inc" - Long Island City, NY USA" (9" wing span ... 4" high meter/cap). Since 1937, the Corps of Engineers Dredge William A. Thompson kept the Mississippi River navigable by maintaining channel widths and depths. This large vessel measures 267 feet in length, was operated by nearly 70 crew members, and was originally propelled by 650 HP engines. As the last of its kind, the Dredge Thompson was decommissioned when new machinery was brought in as a replacement in 2006. In Sept 2002 after the voyage on the towboat PATRICIA GAIL from Cape Girardeau, MO to Memphis, TENN, I drove upriver to Hannibal, MO and the riverside home at "Scipio" of Curt Lees and Ann Sundermeyer who had accompanied me on the trip. The Dredge William A. Thompson arrived in Prairie du Chien on June 13, 2012, and is currently moored in the backwaters of the Mississippi near the Prairie du Chien Marina. Boaters and passersby—as well as those who greeted the vessel upon its arrival—have probably noticed its imposing size and distinctive shape: 267 feet long with the cutter head projecting from the bow and two spud towers rising from the stern. Community Development Alternatives of Prairie du Chien acquired the Dredge in the spring of 2012 from the Corps of Engineers, which desired to find a community willing to receive the vessel and preserve its rich history of service on the Upper Mississippi River. CDA is currently developing plans to convert the Dredge into a Museum of River Transportation. The Dredge William A. Thompson is a wrought iron hull, self-propelled, cutter head suction dredge fabricated in 1936 by the Dravo Company of Pittsburgh,Pennsylvania for the U.S. Army Corps of Engineers (Corps), St. Paul District. The largest and only remaining example of its type used by the Corps, the Thompson was generally considered the best of the fleet and served as a basis for future design of large cutter head dredges. 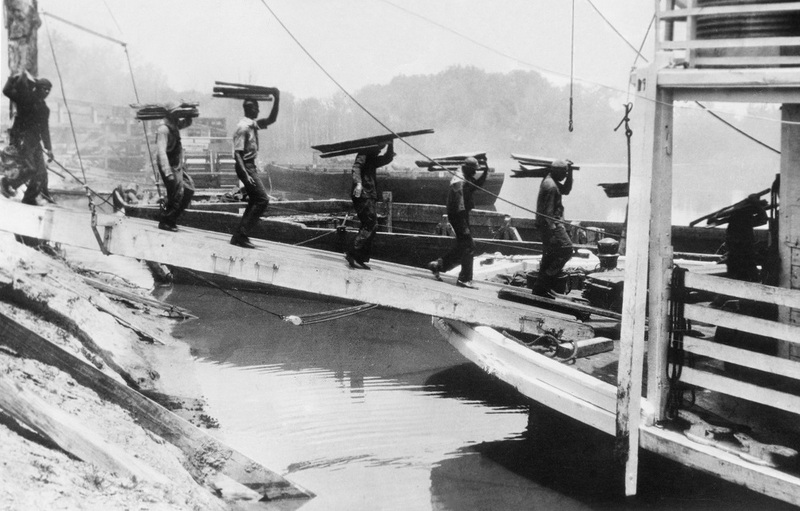 The Thompson holds a distinguished place in the evolution of marine dredge craft. 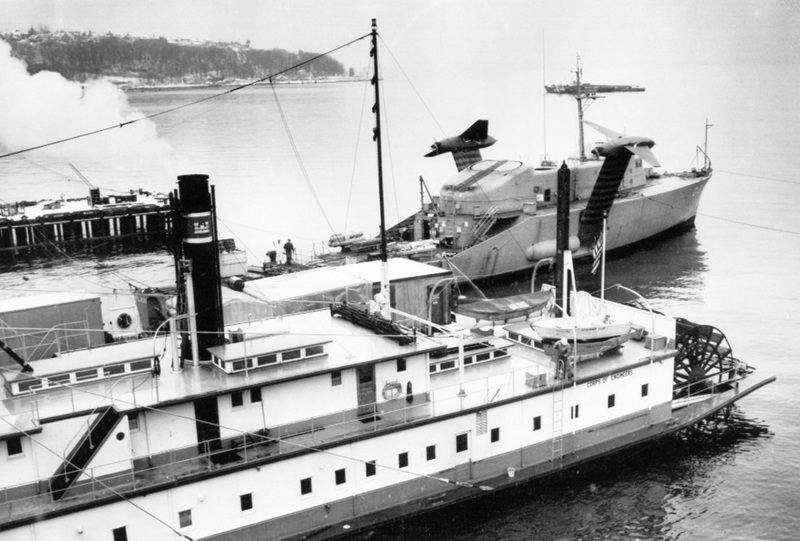 The Thompson is the most original of two cutter head vessels built for the Corps that incorporated self-propulsion via diesel and electric engine systems, on-board crew quarters, and dredge mechanism on a scale not achieved since (McCroskey 5). The Dredge will tell the story of its role in transforming the Upper Mississippi River into a transportation artery, opening the doors for Midwest agribusiness to national and world markets. The museum itself will be a unique integration of political, social, and environmental history, featuring one of the few and best-preserved dredge artifacts in the United States. No other restored dredge can claim the Thompson's singular place at the intersection of two historical movements: the effort to establish a nine-foot channel on the Upper Mississippi to expand national commerce beyond the rail system; and the technological advancements necessary to develop the machinery to accomplish the task. Once the Dredge is permanently set in its final location, it is envisioned that an access structure would be constructed to provide the public access to the main deck and upper decks. Upon boarding the Thompson, visitors will be greeted by a fully-preserved cutter suction dredge. The four interpretive strategies as determined by a team of academic scholars—Upstairs/ Downstairs (social theme), The Machine, The National Story, and The River—will be accomplished in separate sections of the vessel that comprise different components of the overall Museum tour. Prairie du Chien offers a fitting location for the Thompson. More than 100 years before the signing of the Declaration of Independence, two Frenchmen with five other voyageurs entered the Mississippi River at the mouth of the Wisconsin River. Father Marquette and Joliet laid eyes on what is now Prairie du Chien on June 17, 1673. By 1685, another Frenchman—Nicolas Perrot—built trading posts or forts at various locations, one at the southern limits of Prairie du Chien. 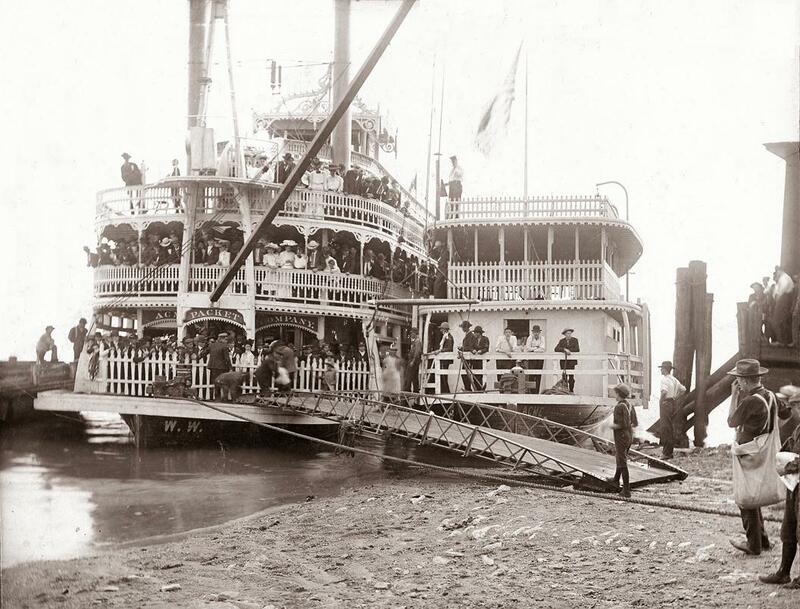 River traffic was the only practical means of transportation for personal goods, and Prairie du Chien was strategically located for this purpose. In 1823, the first steamboat to navigate the upper Mississippi River, named 'Virginia,' arrived on the Riverfront in Prairie du Chien. With the arrival in 1857 of the first rail line connecting Lake Michigan with the Mississippi River, Prairie du Chien soon became a transportation hub—where land, rail, and river transportation came together. Here is an old photo of a small African sternwheel steamboat named SERPA PINTO after a Portuguese explorer and colonial administrator of southern Africa. The gentleman's full name was Alexandre Alberto da Rocha de Serpa Pinto, Viscount of Serpa Pinto ("Serpa Pinto" for short who was born in April of 1846, embarked on his African adventures during the 1860's and died in Portugal in December, 1900. Portugal laid claim to the land on either side of the mouth of the Congo River in 1484 and ran naval patrols near the mouth of the Congo, exacting tariffs from British adventurers and entrepreneurs for the right to trade along the river, who would often traffic in slaves who began as captives stolen from rival tribes and then sold or traded to slave traders who transported them by sailing ships to the Americas. 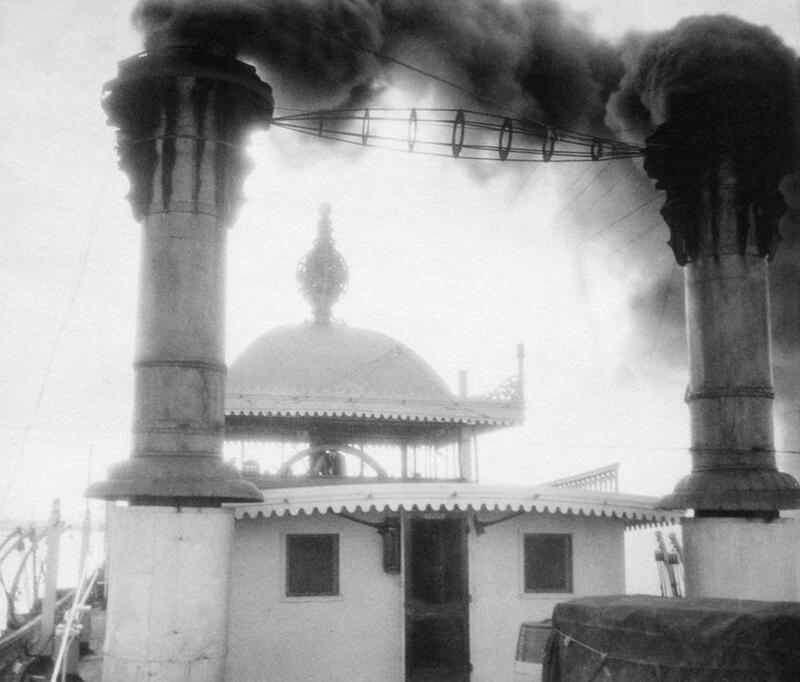 This sternwheeler appears to date from sometime between 1915 and the 1930's. Fore and aft are what appear to have been covered and mounted machine guns that patrols could use to intimidate or fire upon people considered to be trespassing on boats or on shore without paying the requisite tariff. Of course this scenario is mostly conjectured, a historian specializing in the history of Southern Africa during the Colonial era could provide a more definitive story. Illustrated engravings of this sort of craft could be found in boat yard catalogues aimed at a special clientele who would order boats for "Tropical Waters" that could be delivered assembled or in parts shipped by large ocean boats to the coast of Africa, South America and other tropical regions and assembled on the banks of a river and subsequently provide an efficient means of navigation for explorers, merchants & traders, missionaries and enterprising Captains who transported all manner of cargo from captured animals and ivory to civilian and enlisted passengers along narrow streams that wound their way through vast jungles often in uncharted territory. 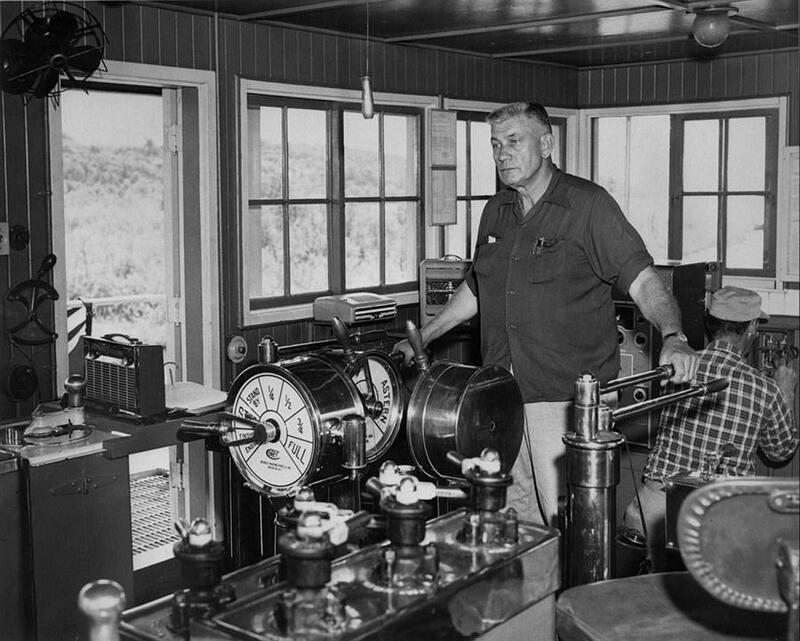 Draftsman was Herbert E. Carlson 1975. The total length of the boat in the print is 24 incheswide and it's matted and framed with non-reflective glass. I scanned it in 2 halves and assembledit in Photoshop. 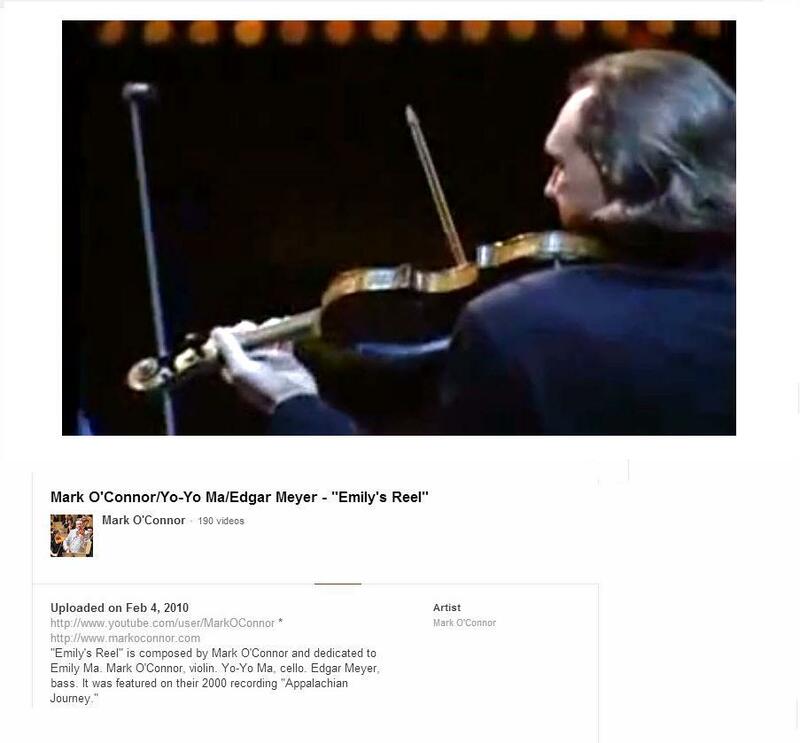 "Emily's Reel" was composed by Mark O'Connor and dedicated to Emily Ma. It was featured on the 2000 recording "Appalachian Journey." 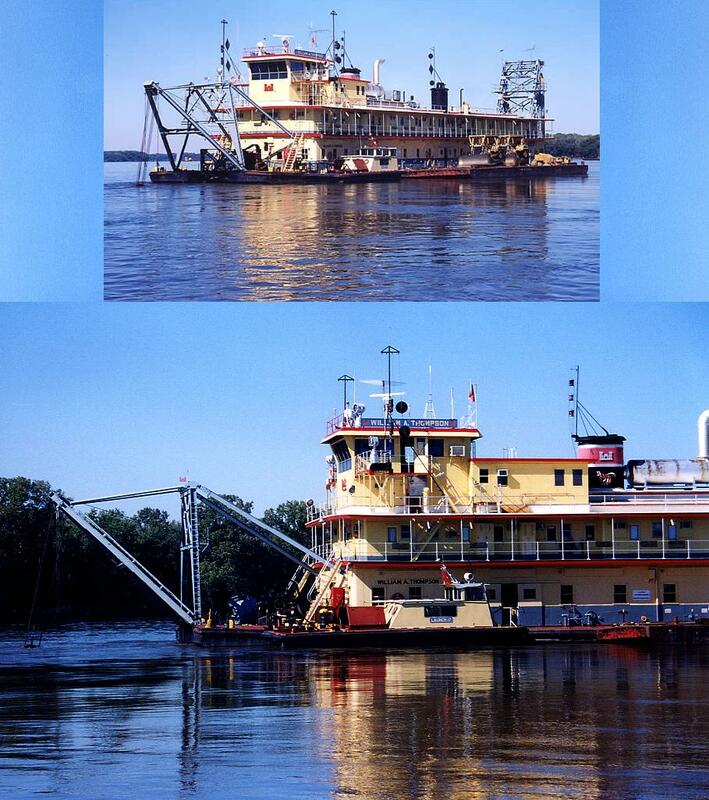 "OLD AND NEW: FROM WHEELS TO WINGS"
The old and new in ships is demonstrated here as the Army Corps of Engineers' sternwheeler, W.T. PRESTON, lies near the PLAINVIEW, worlds largest hydrofoil vessel at the Lockheed Shipbuilding and Construction Co. in Seattle. The PRESTON, which pulls derelicts and other constructions from Puget Sound, is in the shipyard for her annual checkup. The PLAINVIEW is being readied for her final sea trials and will be used by the U.S. Navy for a variety of missions.